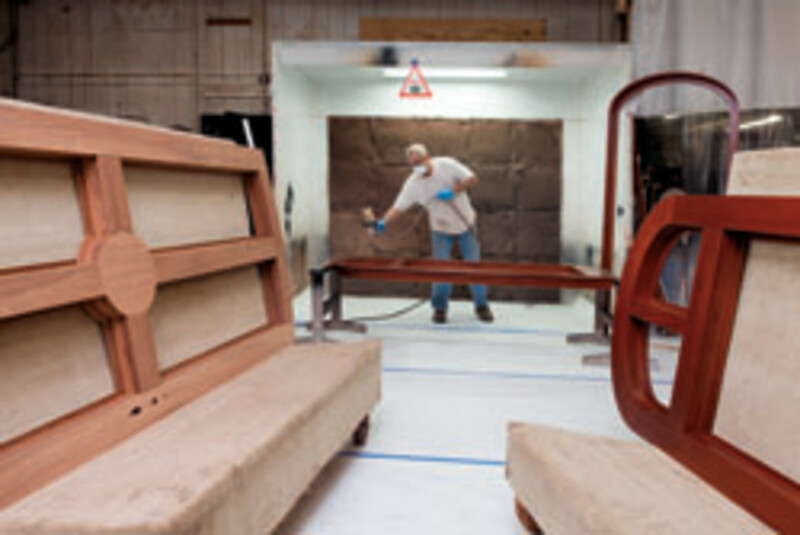 When I was first introduced to waterborne wood finishing products, other than latex paint, in the late 1970s, there were only a handful of companies that had any clear coats available to the small finisher. The complex regulations associated with the acronyms OSHA, EPA, SCAMD, VOC, HAPS, NESHAP were not a factor. 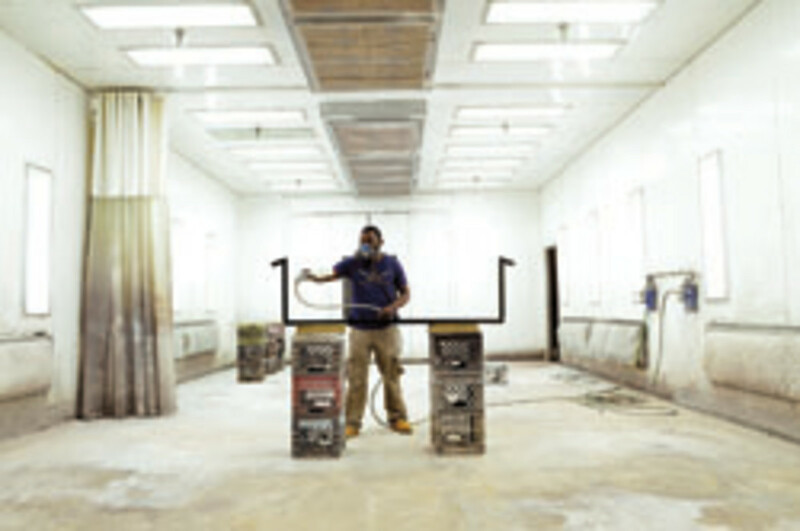 With the passage of several state regulations in the 1960s and 1970s as well as the Clean Air Act Amendments of 1977, users of industrial coatings began to be regulated in the U.S. Some limits on the VOC content of coatings and the methods of application were implemented and have proliferated since. In addition, we have some positive incentives from Leadership in Energy and Environmental Design (LEED), Green Guard, Green Seal and other certifications that might offer a competitive advantage in securing contracts for finishers, builders and manufacturers of finished wood products. Forward-thinking coatings manufacturers are constantly working on improvements in the range, performance and cost effectiveness of its finishing products, not only with sealers and topcoats, but with dye and pigment stains, glazes, colorants, grain fillers, aerosols and other touchup products. Many of the early-generation products imposed too high a barrier to the user. A significant learning curve to make the transition discouraged finishers who were not compelled to switch to waterborne products, while the lack of ancillary products such as stains and fillers required users to use both solvent and waterborne products in the same finishing schedule and there was little readily available training for new users of the waterborne products. It’s time to revisit waterborne finishing systems. Restrictions on solvents and improvements in waterborne coating materials as well as the availability of information and training to assist in the transition make it worth considering. While most any of the available spray guns will spray waterborne coatings, guns specifically designed for that purpose might be advisable. Whenever possible, spray equipment used for waterborne coatings should be dedicated and not used for solvent-based products. If you are buying new guns, consider upgrading at the same time to more efficient models such as HVLP or air-assisted airless, which can save you additional money in material use. All fluid-handling components must be corrosion-resistant, usually stainless steel or plastic. Because the primary drying mechanism in waterborne coatings is usually evaporation of the water component, the speed of that evaporation controls the dry time. Factors influencing that evaporation are temperature, humidity and air movement. Humidity has the greatest effect — in high-humidity conditions, there is nowhere for the water to go. Increasing the ambient air temperature will lower relative humidity as well as increasing the activity of the water molecules, allowing faster evaporation. As the water vapor increases the humidity of the air envelope around the coated item, evaporation slows down so rapid air movement is necessary to change out the saturated air. Some manufacturers recommend increasing the speed of the air passing over the surface to 200 feet per minute or more, either by using blowers or special variable speed makeup and exhaust systems. Temperatures should not drop below 65 degrees during application and drying and 75 degrees or higher is recommended. Many of the manufacturer’s instructions give drying times at 77 degrees and 50 percent relative humidity. Users running a continuous finishing line often install ovens in line to speed the drying between operations. Moisture in the air lines should be 10 percent relative humidity or less. In low humidity areas, such as Phoenix or Albuquerque, N.M., no environmental adjustments are necessary. Normal temperature and air movement should be sufficient. However, excessive temperatures or very high air movement can dry some products too fast, causing some defects in the coating. In spite of the common belief that waterborne coatings are non-toxic, a respirator and adequate ventilation is necessary. Airborne liquid particulate can be aspirated and is more problematic to the operator than dry airborne particulate from solvent-based coatings. There are solvents other than water in these coatings. While, in general, equipment used to apply waterborne coatings can be cleaned with warm and soapy water, some manufacturers recommend their own blend of cleaning solution, formulated specifically for their product. Read the manufacturer’s instructions. There are significant differences between waterborne coatings of a different type (i.e. acrylic, urethane or blends, precatalyzed, conversion varnish) and between coatings from different manufacturers. And never allow the products to freeze. Waterborne coatings and stains have a tendency to raise the grain of the wood, especially on certain low-density woods such as cottonwood and poplar. There are several ways to minimize the effect of grain raise. 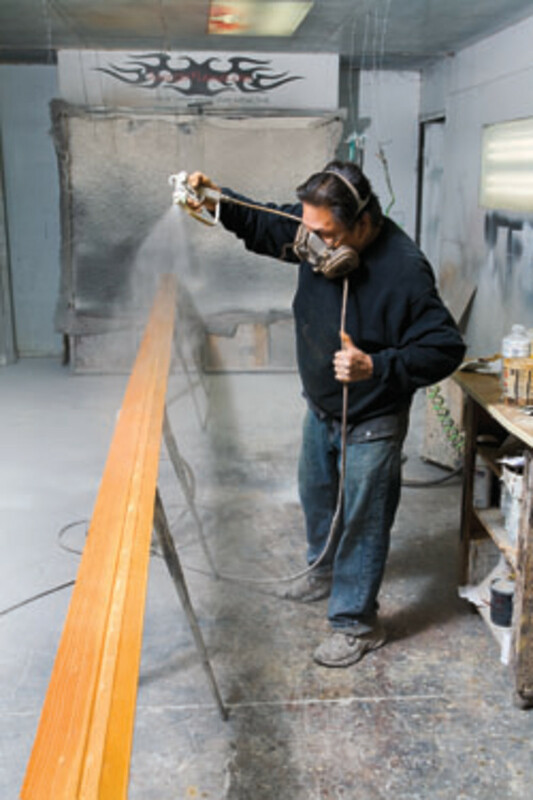 Perhaps the most popular is to wet the wood prior to application of any waterborne finishing product, allow the wood to dry thoroughly and then sand off the raised whiskers. Sanding too much can remove not only the raised grain, but expose unwetted wood that will then exhibit grain raise when wetted with the waterborne stain or coating. There are some patented treatments available to reduce the grain-raising effect from water-based coatings. Even someone who has experience with older generations of waterborne products might have some difficulty adjusting if he doesn’t pay attention to changes that have occurred in the last few years. For instance, one precatalyzed topcoat will gradually lose the potency of the catalyst, thus lowering the performance of the product. The wood should be clean, dry and sanded to 180-220 grit. The moisture content of the wood should be 6 to 8 percent. Prior to application of stain, wet, dry and sand the surface to remove grain raise whiskers. Apply the stain according to manufacturer’s instructions and allow it to dry. 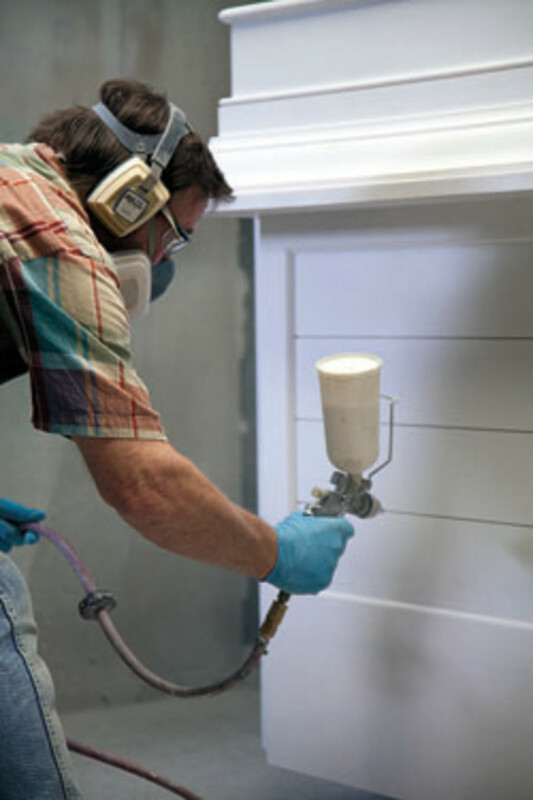 If using a solvent-based stain, allow much more time for a full dry before applying a water-based coating. The sealers and topcoats should be stirred, not shaken. Due to a number of factors, it is easier to generate persistent small bubbles in waterborne coatings than in solvent-based coatings. Even stirring at too high a speed can introduce air into the coating. Stains can generally be shaken without a problem but, again, read and adhere to the manufacturer’s recommendations. Don’t make hasty assumptions or too many generalizations. Product performance varies between manufacturers. As with solvent-borne coatings, straining or filtering is advisable. Virtually all of these coatings are supplied at a ready-to-spray viscosity. Be aware that the viscosity is affected by temperature. Don’t spray the material at lower-than-recommended temperatures. Most manufacturers recommend thinning with water only if necessary and then by a very small addition of water, typically 5 percent or less. Adding 5 percent water could easily have the same effect on the viscosity of waterborne coating that a 25 percent addition of lacquer thinner would have on a solvent-borne lacquer. Some manufacturers recommend various other thinners, retarders, bubble breakers and flow enhancers for their products. Most waterborne topcoats can be applied as self-sealing, but a sanding sealer could help in leveling. Some sealers might have a bit of amber tint for a warmer look. The majority of water-based sealers and topcoats are water-clear when dry and lack the warmth of shellac, varnish and nitrocellulose lacquer. They can, however, be tinted with compatible coloring products. Stains, both dye and pigmented, are available as are dye and pigment concentrates that can be used to color sealers, topcoats, glazes and fillers. This allows the finisher to create shading lacquers for adjusting color and glazes for special effects. Crackle and other specialty coatings might be available from different manufacturers. When applying the coatings, be aware that these are generally of higher solids content than their solvent borne counterparts. They should be sprayed on in thin coats. Since the primary solvent used is water, the film will not flash-dry in the way that a solvent-borne lacquer does, but will take longer to transition from liquid to solid. This allows good leveling, but can cause runs or curtaining if sprayed to heavily. Complaints about a hazy, cloudy or unclear coating can often be attributed to excessively thick coats. Over dark wood or stains, excessive film thickness might exhibit a green or bluish tint. Three to four wet mils is generally considered excessive for a coat. Four mils dry is a good practical maximum for most coatings. Because of the slower drying of the waterborne coating, it’s not uncommon to collect more dust on the film while it is drying. Scuff sanding with 220- to 320-grit stearated sandpaper and wiping or blowing off all dust is recommended between coats. A damp cloth or tack cloth made for waterborne finishes should be used for wiping. Use the lowest air and fluid pressures that allow good atomization. If you are converting a gun that you’ve been using for solvent-based products, you might need to try different tip and nozzle sets to optimize your operation. 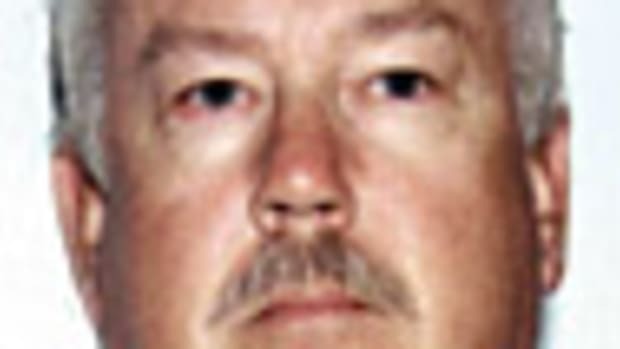 While it is not uncommon to see a gun and spray setup used for nitrocellulose lacquers put away at the end of the day by simply hanging the gun on a hook, this can be trouble with a water-based system. Spray that accumulates on the face of the air cap and around the nozzle is not easily cleaned off and waterborne material that dries inside fluid passages could be impossible to completely clear. Waterborne coatings are available in versions that can be catalyzed or crosslinked to improve their performance properties. Precatalyzed waterborne lacquer and conversion varnish are often used in the kitchen cabinet and architectural industry segments. Careful attention to manufacturer’s application instructions is critical. Once the coating has thoroughly dried — up to a week in many cases — the finish can be rubbed or polished to the desired sheen. While there is a learning curve involved in adapting to waterborne products, more and more finishers and manufacturers are finding that the payoff in terms of health and safety issues, environmental compliance, material costs and reduced property insurance is worth the investment. Certainly it is time to revisit this greatly improved technology to see how it fits into your long-term plans.